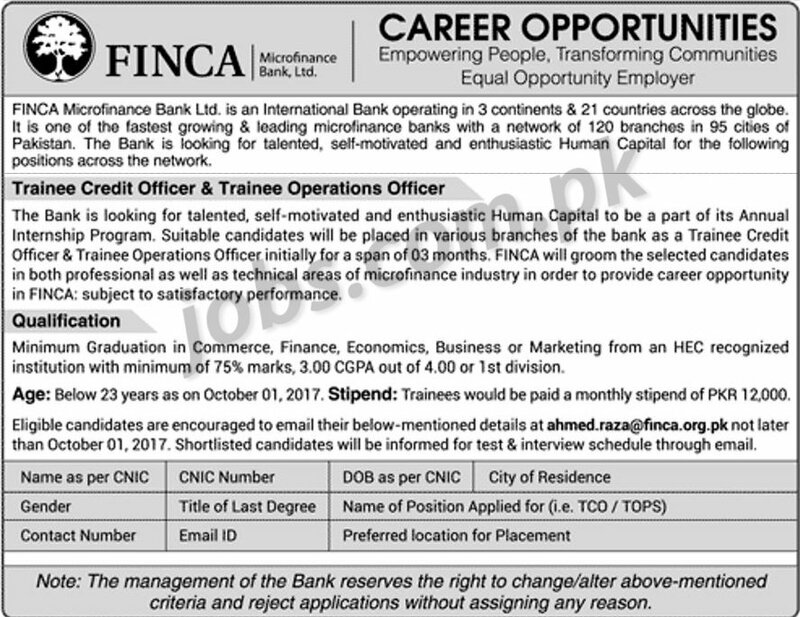 FINCA Microfinance Bank Ltd Internship 2017: TThe Bank is looking for talented, self-motivated and enthusiastic Human Capital to be a part of its Annual Internship Program. Suitable candidates will be placed in various branches of the bank as a Trainee Credit Officer and Trainee Operations Officer initially for 3-months period. 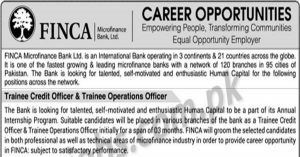 FINCA will groom the selected candidates in both professional as well as technical areas of microfinance industry in order to provide career opportunity in FINCA: subject to satisfactory performance. Only shortlisted candidates will be called for written test/interview. See the notification below to see vacancies/positions available, eligibility criteria and other requirements. Eligible candidates must submit applications on or before 1st October 2017. Qualifications: Minimum graduation in Commerce, Finance, Economics, Business or Marketing from an HEC recognized institution with minimum of 75% marks, 3/4 CGPA or 1st Division. Stipend: Trainees would be paid a monthly stipend of PKR 12,000. Eligible candidates are encouraged to email their below-mentioned details at [email protected] before due date. Shortlisted candidates will be informed for test & interview schedule through email.